Whether we’re talking busy weekdays and lazy weekends, our hair can quickly become the very bane of our beauty routine. Spending time on styling or—let’s be honest—just taming our locks to look presentable is touch-and-go at best. That’s when easy, low-maintenance hairstyles and dry shampoo come in. For us, messy buns are the saviors of all days running late or skipping showers. The trick is perfecting the “undone done” look without going too disheveled or slipshod. 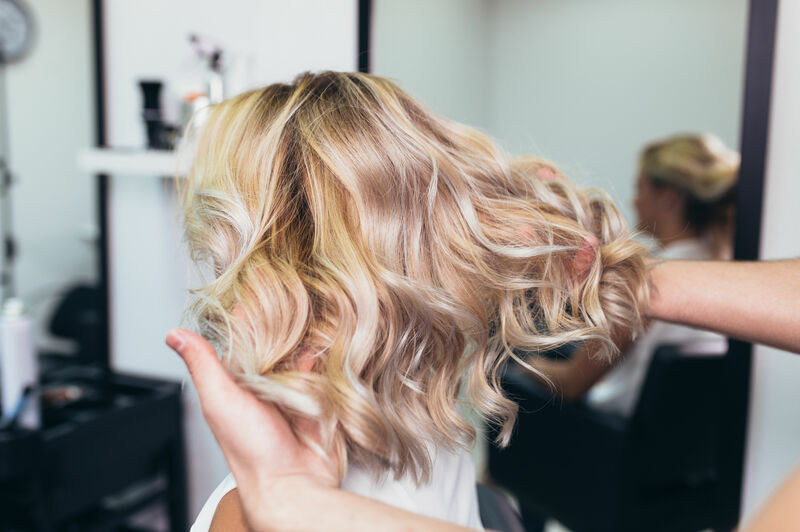 But unlike the paradoxical reality of beachy waves, which actually require a laundry list of products and hot styling tools (and no beaches in sight), messy buns don’t have to be a 12-step process. You can master the messy, yet polished bun in steps you can count on just one hand and with just a few elastics or pins. Cute hair accessories—bun cuffs, pins, and headbands—are the quickest way to ramp up the style of a basic messy bun in seconds, and the messy bun has even been revamped to be royal after Meghan Markle stepped out publicly with Prince Harry rocking a low messy bun pumped with volume and framed with loose pieces around the face. Find inspiration in these gorgeous and doable messy bun hairstyles that keep you looking pretty and polished on any day. This hairstyle looks as ready for a wedding reception as a workday, which is seriously impressive considering it takes about two minutes, two hair elastics, and maybe two pins! Get the tutorial here at Express-O. We love the way the braid sits so prettily on top of a Dutch braid, as opposed to a French braid. These double Dutch braids make any messy bun, topknot or low bun, look awesome. You can secure the two braids with clear elastics before pulling hair into a bun to make sure they don’t fall apart in the process! This chic half bun works well for second-day hair with some dry shampoo to hold up the bun all day long. We recommend using pins for secure this to ensure it doesn’t lose volume or height. This easy style looks effortless without looking drab, and it works great for ladies with naturally straight hair that can’t hold up a high bun as well as coarser, curlier hair. Simply secure hair in a low ponytail, loop the ends through the elastic once more (but only halfway), and then wrap a single section of the excess around the base, securing with a pin. Leaving some of the excess ponytail hanging out adds to the laidback feel of this look. A pop of color is perfect for any last-minute topknot in the spring or summer, and a small silk scarf looks both poised and stylish. After securing the bun, wrap the scarf around it and tie. Find a similar scarf here. This tutorial works on lob-length hair by using a technique that starts with just a low pony! A few pins later, and you’re set. This look is very similar to the messy bun that Meghan Markle has been wearing for royal public appearances. Get the tutorial here from Bloglovin’. If you have a knack for French braiding, this stylish bun is the easiest way to look polished on any day. This style doesn’t even require any pins! Get the tutorial here at Dani Marie. This ultimate big bun looks put-together and preppy with its adorably bow-like style. You’ll look ready to take on the day in literally two minutes! Get the tutorial here at Impressions. This best-selling bun cuff looks stunning on this low, messy French twist-esque bun. A bun cuff allows you play around with how you cinch and hold your hair, and this cuff works amazingly for buns, ponytails, and half-up styles. This style gathers hair into a loose twisted bun before securing. Get this bun cuff here at Chloe + Isabel. This style looks polished, but un-fussy. It's loose in the way that looks effortless, but won't fall out on you! Get the tutorial here from Camille Styles. A reverse braid is a little harder to master, but it sure comes in handy once you learn it! This messy topknot gets instantly more polished thanks to the upside-down Dutch braid. Get the tutorial here from Lulus. The easiest way to make a second-day hair messy bun look completely intentional is by accessorizing with fun headbands! Ladies are doubling up two skinny headbands to put some extra volume and playfulness into an everyday hairstyle. Find cute skinny tortoiseshell headbands for this look here. Any messy bun looks stylish and pre-planned when using a fun accessory, and nothing is classier than these pearl-like pins and ponytail holders from Chloe + Isabel. This bun uses a basic low twisting style, but secures with the ponytail duo in a pretty rose gold color. Get the ponytail holder duo here at Chloe + Isabel. This bun is perfect for busy weekdays or lazy weekends. After adding some texturizing spray, secure hair in a low ponytail. Then, pull the ponytail through the elastic one last time, stopping a little short to create a loop. Twist the extra hair around the base and secure with pins. Finally, pull apart the gathered loop to create the loose, messy texture and fanned look. Update your easy twisted low bun with two crossing braids. Start by separating two small sections of hair around the face, by the ears. Pull the rest of the hair back into a bun, then secure with an elastic. Braid both sections, moving back towards the bun. Secure each with bobby pins in the center, weaving them together to look uniform. Dallas-based style blogger, Courtney Kerr (pictured above), dubs this look her “good, bad hair day.” If even dry shampoo won’t cut it anymore, this easy topknot sealed with a pretty silk turban is her answer to looking stylish against all odds! Find a similar style here. For this look, you secure a clear elastic towards the end of your hair to make sure disaster doesn’t strike and hair doesn’t fall out from all directions! After that step, twist into your usual bun and secure with pins, letting that bit fall out. Get the tutorial here from The Beauty Department. Get two adorably messy buns for one price with this look! This simple two-step process gives you playful and stylish buns that use texturizing spray and a little teasing to add volume. Get the tutorial here from The Beauty Department. This beautiful bun is romantic with a touch of glam, and we're thinking we've seen this look on the likes of Blake Lively, perhaps? Get the tutorial here from Barefoot Blonde. We love a classic hairstyle like this timeless chignon, but dress it down with a fun accessory and loose pieces. This tutorial even includes instructions for making this DIY copper hair piece. Get the tutorial for the chignon and the hair accessory here from Paper & Stitch. Our signature Southern Living messy bun is incredibly easy with only four steps and looks way more fancy than your average bun. Get the tutorial here from Southern Living. We just discovered that there are baseball caps made specifically for messy buns—ladies, rejoice! There’s an added cutout farther up that will fit your messy bun perfectly, letting you look casual chic any dirty-hair day. Get the messy bun baseball cap here.